[Friday, July 1, 2005] According to a new NASA study, when America goes back to the moon and on to Mars it will do so with hardware that looks very familiar. [Tuesday, July 5, 2005] The United Nations Office for Outer Space Affairs, within the framework of the United Nations Programme on Space Applications, is providing African institutions free of charge with Global Landsat data sets donated by the United States. [Wednesday, July 6, 2005] Alcatel Space, a subsidiary of Alcatel and Shin Satellite Inc. of Thailand, a major satellite operator, today announced the signature of a contract for the construction of the Thaicom 5 communications satellite. [Wednesday, July 6, 2005] With new developments aimed at benefiting life in space and on Earth, a host of inventors at NASA's Johnson Space Center will be honored for their achievements and patents at a luncheon July 7. [Wednesday, July 6, 2005] The launch of Thaicom 4 (ipstar) is delayed by several days. The discovery of an anomaly with ground equipment used to prepare the Ariane 5 launcher has resulted in Arianespace�s decision to perform additional checks. [Wednesday, July 6, 2005] Millions of virtual rubberneckers spent Monday morning watching a cosmic collision, as NASA's Deep Impact spacecraft collided with comet Tempel 1. The deep-space smash was designed to give scientists a peak at the early solar system. [Wednesday, July 6, 2005] NASA anticipates amending this RFP by no later than the end of July 2005. Pending issuance of that amendment, the due date for all proposals is delayed indefinitely. [Friday, July 8, 2005] "This is a notice of our intent to award a contract on a noncompetitve basis to the Johns Hopkins University Applied Physics Laboratory (JHU/APL) for the following services." [Friday, July 8, 2005] NASA is considering adopting policies and developing plans and procedures to expand access to and use of the Shuttle Landing Facility by other government agencies and their contractors, university research and technology programs, and commercial users. [Friday, July 8, 2005] All bets will be off July 21-23 at the Flamingo Hotel in Las Vegas as private industry and NASA representatives meet to tackle the challenges of returning humans to the Moon. [Tuesday, July 12, 2005] NASA awarded two 8 month contracts, each worth approximately $28 million, one to Lockheed Martin Corp. and the other to Northrop Grumman Corp. and The Boeing Co. to support a July 2006 review for the new Crew Exploration Vehicle. [Wednesday, July 13, 2005] NASA is considering retiring a Space Shuttle orbiter in 2007 and beginning modifications to one Shuttle launch pad at the Kennedy Space Center under a plan now being reviewed at NASA headquarters, according to senior agency sources. [Thursday, July 14, 2005] This notice is being issued as a Request for Quotations (RFQ) for preliminary design and analyses efforts for the Lunar Reconnaissance Orbiter (LRO) Propulsion Subsystem (LPS) propellant tank and nutation analysis efforts for the entire tank set. [Friday, July 15, 2005] Spacehab announced today that it has terminated its shareholder rights agreement, commonly known as a "poison pill." [Tuesday, July 19, 2005] The office will coordinate the worldwide effort in finalizing the company's suborbital spaceflight program and will be located at the Center for Space Education building, the home of the Astronaut Memorial Foundation. [Tuesday, July 19, 2005] After 20 years of waiting David Buck finally got his wish- to escape the surly bonds of Earth (or at least it's gravitational pull). [Tuesday, July 19, 2005] PanAmSat has signed an agreement with Alcatel, the French-based communications leader, for the acquisition of multiple European orbital slots as well as a powerful satellite with a footprint over Europe, the Middle East, Africa and Asia. [Thursday, July 21, 2005] This past weekend, fifteen very lucky Florida science teachers experienced the thrill that only a few hundred astronauts have had -- flying in zero-gravity. [Thursday, July 21, 2005] NASA's Science Mission Directorate (SMD) selected 11 technology investigators as part of the New Millennium Program, Space Technology 9 Project. The Project will flight demonstrate and validate technologies. [Friday, July 22, 2005] The Astronaut Glove Challenge award will go to the team that can design and manufacture the best performing glove within competition parameters. The $250,000 purse will be awarded at a competition scheduled for November 2006. [Sunday, July 24, 2005] NASA is completing an internal review that proposes using an expendable launch vehicle derived from space shuttle components to launch and complete the International Space Station following retirement of the shuttle orbiters in 2010. [Tuesday, July 26, 2005] "The purpose of this sources sought is to identify potential sources for small business subcontracting opportunities during phase II performance." [Wednesday, July 27, 2005] NASA's Space Shuttle Return to Flight (STS-114) launch was one of the biggest events in Internet history. Internet users watched approximately 433,000 simultaneous webcast streams of NASA TV during the launch. 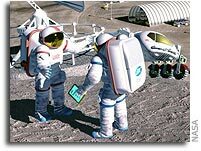 [Thursday, July 28, 2005] Senior NASA officials chose the Space Frontier Foundation's "Return to the Moon VI: Reality Check" to articulate the importance of America's emerging commercial space industry to achieving the new U.S. Vision for Space Exploration. [Thursday, July 28, 2005] The launch of Arianespace's next Ariane 5 has been set for the early morning hours of August 11 from the Spaceport in French Guiana, carrying the largest commercial telecommunications satellite ever to be placed in geostationary transfer orbit. [Thursday, July 28, 2005] In a ceremony at the NASA GSFC, Lockheed Martin employees and teams engaged in operating and servicing the Hubble Space Telescope have been recognized for their work with Goddard Awards of Excellence. [Thursday, July 28, 2005] Sir Richard Branson (Virgin Group of Companies) and Burt Rutan (Scaled Composites) announced their signing of an agreement to form a new aerospace production company to build a fleet of commercial sub-orbital spaceships and launch aircraft. [Friday, July 29, 2005] On a semi-annual basis, NASA invites new, emerging domestic launch service providers that meet the minimum contract requirements to submit proposals during an open season. [Saturday, July 30, 2005] "The Exploration Systems Mission Directorate (ESMD) is hereby canceling the Technology Transfer Transformation (TTT) Request for Proposal (RFP)."